The case was heard in the High Court on March 27 and, on March 29, 2018 and the case was dismissed. Judge Dawie Fourie ruled that the application was not urgent and struck the case off the roll, with costs. Agreements were later signed. The 27 projects will amount to R55.92 billion ($5 billion) in new direct investment in the energy sector and create the much needed jobs for South Africans. These projects will be located in different parts of the country mainly in rural areas. The National Union of Metalworkers of South Africa (Numsa) and transform RSA turned to the Gauteng High Court in Pretoria on Tuesday to obtain an urgent interdict to prevent Eskom from signing 27 renewable energy contracts. The applicants said if Eskom and government were allowed to go-ahead with signing the contracts, it will not only result in massive job losses, but it will also result in economic suicide. Judge Cynthia Pretorius at the time refused to grant the interdict and the matter was postponed to Tuesday. Counsel for the minister at the time agreed that the signing would not go ahead, pending the outcome of these proceedings. Cassim said it will be argued during the main application – which is expected to serve before court within a few months – that electricity currently purchased from IPP’s is sourced at R2.14 /kWh whereas Eskom can produce the same energy at R0.32/kWh. President Cyril Ramaphosa speaks about South Africa’s renewable energy programme in Parliament on Wednesday (August 22 2018). Economic Freedom Fighters leader Julius Malema has accused President Cyril Ramaphosa and his administration of rushing into signing the Independent Power Producers agreements for the benefit of the president’s business associates and his brother-in-law Patrice Motsepe. Posing a question during the president’s scheduled question and answer session in the National Assembly on Wednesday, Malema asked Ramaphosa: “Why did the government rush to sign the Independent Power Producers [IPP] agreements when Eskom has the electricity capacity available at a cheaper price. “When you eventually plug [the electricity generated by] the Independent Power Producers into the national grid will this not lead to a loss of jobs for a lot of Eskom workers or is this merely another cash heist that seeks to benefit your business associates and your brother-in-law Patrice Motsepe,” questioned the EFF leader. Ramaphosa, who remained composed, laughed off the suggestion and said: “For some reason I knew that this is where you were going with this line of questioning”. The president’s visibly clam demeanour was, however, debilitated by his wishy-washy response. “Truth be told, Honourable Malema, the costing of the IPPs may seem exorbitant now but the power that is generated by these IPPs when incorporated into the national grip will be mixed with the power that is generated from our nuclear power station. It will also be blended with power generated from our coal powered stations and the prices at the end will not reflect where the power was produced,” waffled Ramaphosa. The president regained his composure and was more articulate when he argued that the renewable power was sustainable and, with time, the power produced by these IPPs would become cheaper than what Eskom produces. “Most of Eskom’s power stations are on their last legs” argued Ramaphosa, “and the real question here should be how do we make sure that the workers currently employed in these power stations will not be left stranded once they shut down”. 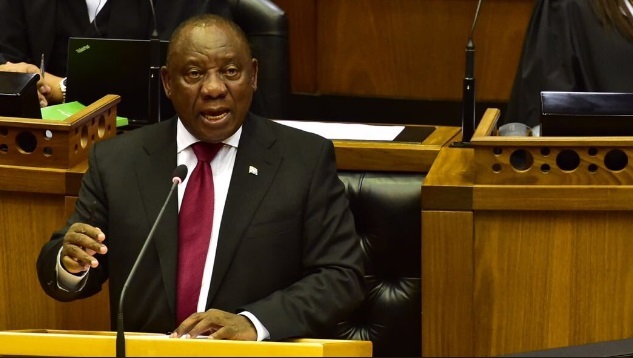 Ramaphosa assured the members of Parliament that he was not advancing the interests of a third party. “In my current position [as president] I am very aware that I should never seek to advance the interests of relatives or people who are close to me and there should never be a suspicion that either myself or the minster of energy Jeff Radebe [who is also Ramaphosa’s brother-in-law] are advancing the interests of any individuals,” said the president. Ramaphosa even went as far as telling the EFF leader that if he had any evidence that pointed to any wrongdoing he should bring it forward and stop casting aspersions. This is not the first time Malema has publicly accused the president of using his position to benefit his in-laws. Last month, on the occasion of the EFF’s fifth anniversary, Malema issued a stern warning to business mogul and Ramaphosa’s brother-in-laws Motsepe, saying that he “would do to him what was done to the Gupta family”. Malema again highlighted Radebe’s signing in April of the R56-billion contract with 27 independent renewable energy power producers – expected to add 2300MW of electricity to the national grid over the next five years – as a move aimed at benefiting Motsepe. The EFF leader has thus far not revealed any evidence to this effect but maintained that the president and his inlaws were “capturing South Africa”. During the question and answer session Ramaphosa also made it clear that the programme of land redistribution was necessary to heal the “historically festering wound of land dispossession and would enable the transformation and development without which South Africa will experience instability”. The president, however, opposed the EFF’s stance that the state should be the custodian of the repossessed land, saying this “model would frustrate those who want to own their own property”.